For someone currently based in London, it is impossible to avoid coverage of the disaster that is continuing to unfold in Haiti. Radio and television here has frequent updates on the relief effort, while newspapers are urging everyone to make a donation. What about coverage in Turkey, where the Haitian story should sound horribly familiar? Nomadic View makes the observation that coverage in the Turkish press has been limited, preoccupied instead with such matters as the Danny Ayalon fracas. Turkey is experienced at earthquake rescue, and some of the country’s finest rescue workers have done some heroic things since arriving in Haiti a few days ago. However, it is the United States that is driving the aid and relief effort, and Nomad says that coverage of this point has been scant. It is immensely difficult to explain the sensation of a violent earthquake to someone who has never been in one. Like most people in Turkey on Tuesday 17 August 1999, I was woken at 3.02am – when the walls of my seventh-floor flat began bobbing and revolving like a boat on stormy seas. We made our way downstairs in the dark to sit in the car and listen to the confused overnight radio presenter tell us that she had no idea how bad things were. The mobile phone network was jammed; everyone, like us, was ringing relatives who lived closer to the epicentre. It is the sense of fear that is most difficult to describe, and is what Haitians will have felt too: fear of a great, faceless, brutish wave that destroys a way of life in mere seconds. I was in Ankara for Turkey’s earthquake, hours away from the epicentre, where the only earthquake-related casualty that night was the city’s electricity supply. I will never forget how hauntingly bright the stars were in the sky that night. Anatolia, the land mass upon which Turkey lies, is riddled with fault lines, and history has recorded hundreds of destructive earthquakes there. Istanbul, a city of 12 million, is particularly vulnerable, but so is the whole of Turkey’s northwest, as the country learned so painfully on 17 August. The 7.6 magnitude earthquake that struck that morning officially killed 17 thousand, but an order was later quietly made for tens of thousands more body-bags. It remains Turkey’s worst natural disaster. Seismologists have been saying for the last six years that another tremor on the scale of 17 August can happen at any minute in Turkey’s northwest. A parallel but rather low-key discussion in the Turkish press has been questioning Turkey’s preparedness. But there has been some considerable planning, from determining high-priority roads to introducing stricter construction regulations. The Turkish Red Crescent ran an exercise in Istanbul in May last year, and schools in the area do now teach children to take refuge under their desks. But critics say the campaign needs a much higher profile, and that everyone needs to be made aware of what to do, how to prepare and whether their homes are in a high-risk area. The problem, some say, is that people are inclined to forget painful memories rather too quickly. 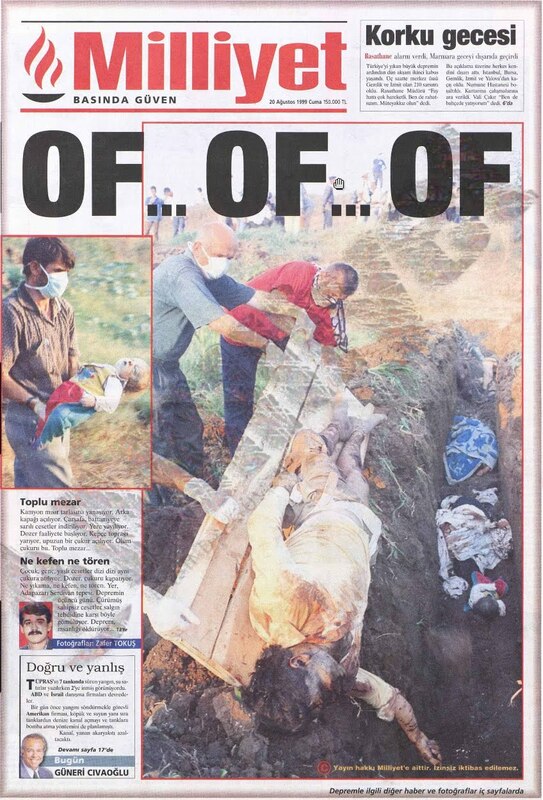 Milliyet cover originally published Friday 20 August 1999. Available online at the Milliyet archive. Bombing mosques and war with Greece?